The University of Maine Black Bears celebrate their 68-48 victory over Hartford in the America East championship game at the Cross Insurance Center in Bangor, Maine. The University of Maine’s NCAA women’s basketball tournament game against North Carolina State on Saturday will be shown live on ESPN2 from Raleigh, North Carolina. Game time is 1 p.m., but it may start later if the earlier game between the University of Kentucky and Princeton University goes long. The UMaine-North Carolina State game will start approximately 30 minutes after the conclusion of the Kentucky-Princeton game. The winners play on Monday in Raleigh. Follow along with live updates, scores and more with the Bangor Daily News live blog, which is available here. The game will be carried in its entirety on ESPN2 in the state of Maine according to an ESPN spokesperson, so it won’t be involved in whiparound coverage that shows parts of numerous games based on the scores. If a state school such as UMaine is involved, the network tends to air the entire game in that particular state. The game will also be carried on radio by WGUY on 96.1 FM and 1230 AM, and it will be live-streamed on computer at ESPN3. Televised UMaine games are good for business, particularly local eating establishments such as Hero’s Sports Grill in Bangor, according to Hero’s owner Quinn Paradis. 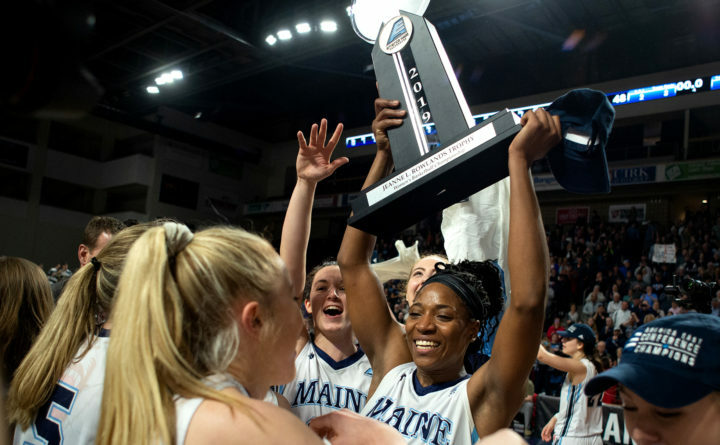 Paradis said they had a great crowd to watch last Friday’s UMaine-Hartford America East women’s championship game even with the game being played at the nearby Cross Insurance Center. Paradis noted that the UMaine’s three televised Football Championship Subdivision playoff games were huge for his business. He estimated that they experienced a 40 percent increase. “My guess is Saturday’s basketball game will give us a 20 to 25 percent boost,” Paradis said. “It will be lunch time. People can watch the game while having lunch. Hero’s also will be showing NCAA men’s basketball tournament games. “We have 32 televisions and the Maine game will be on every fourth television,” Paradis said.